Angela Kulig: Read my new book THE GODS OF MARKET STREET for NADA! Read my new book THE GODS OF MARKET STREET for NADA! That's right! I have turned my unreleased novel, The Gods of Market Street into a serial and listed the first chapter on JukePop Serials. I originally wrote the book for the 2011 Three Day Novel contest. I *really* wanted to add another book to my list in the first half of the year, (other than the ones scheduled Pigments of My Imagination, Dust of the Dead Sea, Barneby Knotts) but I just couldn't fit it in. This is a fun new venue I am trying out. It helps me give away my books for free, which I enjoy, in a completely different environment. The only thing I ask is that you take a moment to vote for The Gods of Market Street if you enjoy it. Chapter 2 and 3 will be up soon. Want to win a $40 Amazon giftcard? Check out the details below! Grace Teller is no one. All that is left of her former existence are shadows of memories, no weightier than the daylight, and fading just as fast. Yet, in the center of her being, are the things the universe is made of--and something even older than that. As the storm inside her mind becomes a cloudburst over New Orleans, Grace seeks out the only person who might know who she was supposed to be: her father. Only when she is around the god-like Carawyn does Grace wonder if who she is right now is maybe all that matters. But as the newness wears off on her new life, the person responsible for erasing the old one resurfaces--claiming that she belongs in Grace's new family as well. 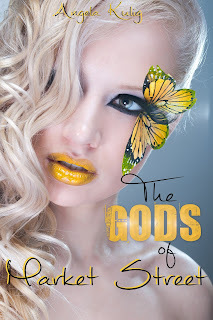 The Gods of Market Street is a Young Adult Paranormal Romance. I've never been to JukePop before. So you'd like people to vote for it on that service? Does one need an account, or can a fan click with impunity? Yes, jukepop is an interesting new venue. You vote on which serials you would like to see continued. You can either log in with facebook or create a jukebox account. LOVE the cover!! The colors are so vibrant and it's so so pretty!!!! Good luck with it!! Such a good first chapter. Cant wait to read the rest!! I love the cover. it's so pretty. The first chapter was great and I also love the cover. Great job Angela. It sounds great - a.d that is a FABULOUS cover!! I love the idea of serials, after all, that's how many stories used to be published, as serials in magazines and not one print book! I hadn't heard of JukePopSerials either, so thanks for the alert! Good luck with this new experiment! Happy Birthday to my FAVORITE little hobbit!